Which one of the 4 football encounters below does not logically belong there? And the correct answer would be C) B36 Tórshavn vs. HB Tórshavn. However, this is not an IQ test, and therefore B36 Tórshavn vs. HB Tórshavn does belong in that good company. 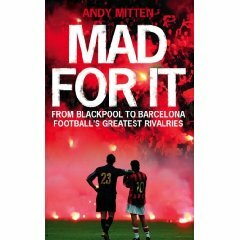 It does so, because all of these classic football encounters above alongside several others like Argentina vs. Brazil, Celtic vs. Rangers, Iran vs. Iraq and several more, are the subject of a book by Andy Mitten, who has travelled the world attending some of the most famous football clashes. And among those, there was actually room for the Tórshavn derby between B36 and HB. The title of the book is: Mad for It. - From Blackpool to Barcelona. Football’s Greatest Rivalries. Andy Mitten visited the Faroe Islands in 2006 when B36 inflicted HB one of their worst defeats ever. The result was 6-0! (You can read the match report from that match here). However, HB still went on to win the title at the end of the season in one of the most dramatic finishes to a season ever (You can read a report from the thrilling last round here). But the reason why this, compared to the other, minor Faroese classic is included in the book is for its contrasts to many of the other more famous clashes, because were there often can be real hatred between the fans of those teams, Andy Mitten described the B36 vs. HB match as the most friendly derby he had ever witnessed. In an interview in Faroese radio station Rás2 (Channel2), Mitten said something along the lines of "that the absolutely most horrific thing he had witnessed in the Tórshavn derby was when one B36 supporter had said that HB-player Jákup á Borg was no good". Mitten thought that it was quite amusing that such a minor offence was the most horrific thing going on in a derby. "Right now, the taxpayers' money is being spent escorting those travelling Sunderland fans who have definitely visited Newcastle. Trying to get at them are hundreds of gloating Geordies, many hoping to re-enact battles between the rival cities which pre-date football by centuries. If they do, there could be a repeat of the scenes in March 2000 when more than 70 rival hooligans took part in some of Britain's worst football-related violence. Sunderland's 'Seaburn Casuals' clashed with Newcastle’s 'Gremlins' after boarding a ferry over the Tyne to North Shields. They fought for five minutes with knives, bats and bricks. One man was left permanently brain-damaged. Thirty nine were arrested and several jailed after the jury were told that the violence had been like a scene from the film Braveheart." And that, Mitten thought was quite hilarious as he has interviewed players like Ronaldinho, Roy Keane, Lionel Messi and Steven Gerrard to name a few. – But a Faroese amateur player stood him up! The book is getting rave reviews and is well worth the read. rest of the world should (probably) buy it here at amazon.com .